Let’s walk through creating your first email campaign. 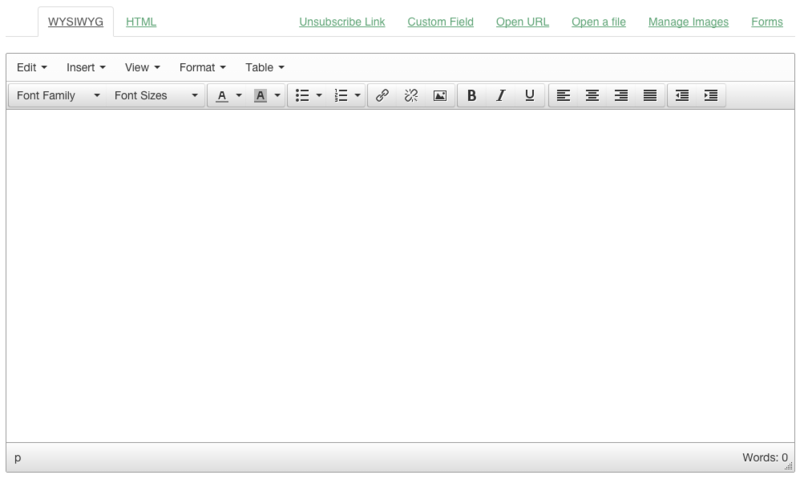 Follow the steps below to set it up, create your content and define who will receive the email. Click on the HTML tab that appears above the WYSIWYG editor if you’d rather edit the campaign’s HTML directly. You also have the option of importing pre-written HTML by clicking the Open URL or Open a File links that appear above the WYSIWYG editor. Unsubscribe Link will insert an unsubscribe link when clicked. Custom Field brings up a prompt which allows you to select a custom field, such as First name. After clicking on your desired custom field name, a placeholder string, like %%First_name% will be inserted. This placeholder will automatically be replaced at send time with the actual custom field value. Manage Images lets you upload images to GreenArrow Studio to use in your emails. It also lets you select previously uploaded images. Forms lets you insert a link to a web form. An example of a web form is a Modify Subscriber Details form, which allows subscribers to update their subscriber record. Next, let’s compose the text version of this campaign. Segmentation options are outside the scope of this article. See our Segmentation Builder Basics article if you’d like to learn more about this topic. 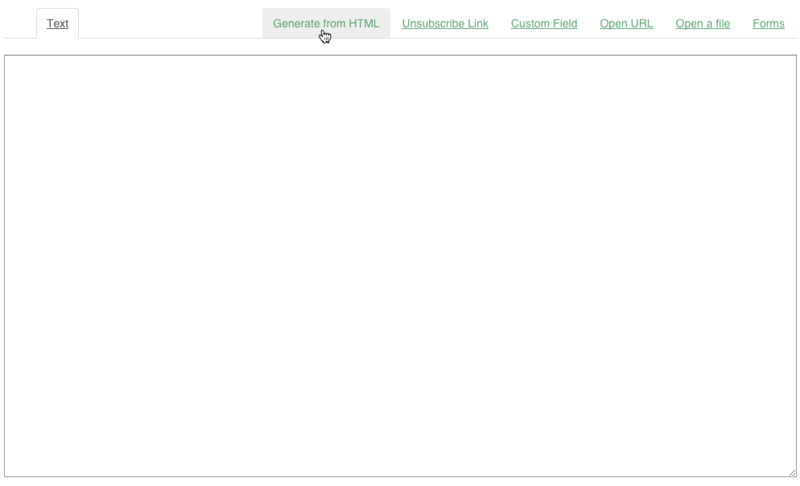 Many of the delivery settings that you now see had their default values defined when the mailing list was created. See our Import Your First Mailing List article if you’d like more details on those settings. Congratulations! You just created and sent your first GreenArrow Studio campaign!